The Installment Billing function in the InOrder ERP system can be used for large purchases for which customers can make multiple payments, as well as subscriptions, kits, or any other item you sell. You can make your products available immediately to your customers while accepting payments over time. Linking an installment plan to a promotion allows your customers to take advantage of special purchasing opportunities. InOrder Installment Billing is the perfect tool for providing your customers with a personalized and professional shopping experience. InOrder provides an accurate and efficient payment schedule for each order using a billing plan. Simply add the payment – InOrder does the rest. InOrder Installment Billing Plans work with Customer Service orders, Order Entry orders, and with orders entered on your web store. Your customers can buy when they’re ready to buy. Setup is quick and straightforward. Installment plans are defined to identify the installment plan, determine the minimum amounts, dates, payment schedule, order classes, and promotions. Associating installment plans with order classes provides templates for each of your order types. They provide default settings for shipping, handling, promotions, territories, pricing, payments, messages, etc. This gives you control and consistency, while still being flexible with the ability to verify or override specific information. Totals for orders with installment plan payments continue to reflect the original order total. 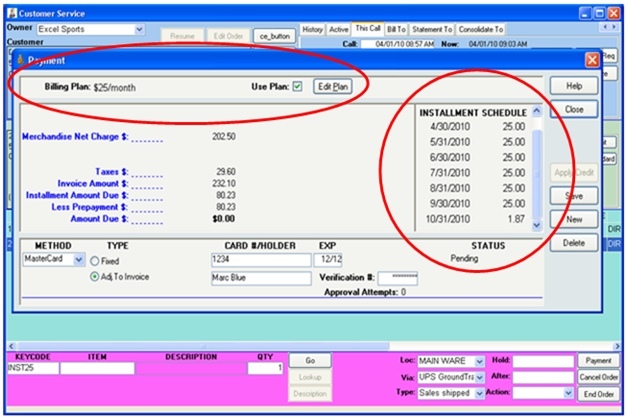 Because the order itself can be modified and re-totaled indefinitely, the actual billing events (including manually edited installment billing events) and amounts (with optional payment amounts) are re-computed each time the order is re-totaled. Future installment payments are shown in the A/R Lookup window. For each customer with an installment plan, you can see how much is due, and when it is expected. For more information about using installment plans with InOrder, please contact us or click here to request a demo.